Bucharest is laid out around several large plazas linked by wide avenues in many cases and narrow streets in others. The architecture of the city is eclectic, to say the least, with a strong French influence tempered by dashes of Italian, Spanish, and Middle Eastern design. 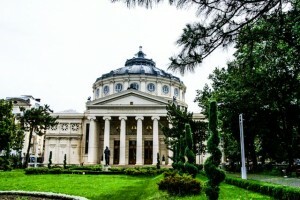 Although Bucharest suffered a good deal of damage during World War II, many of the elegant nineteenth-century buildings survived and have been restored. Romania is strongly Catholic (of the Orthodox branch), and Eastern Orthodox churches abound in the city, despite 45 years of Communist rule after the war. One of the most beautiful buildings in the city is the Athenaeum, built in 1888 as a concert hall and still in use for that purpose today. 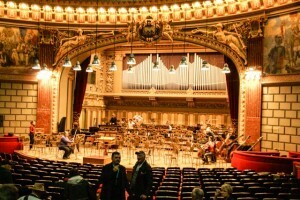 In fact, during our visit, musicians were assembling and warming up onstage for an orchestra rehearsal. When we walked into the grand foyer on the ground floor, the sight literally took our breath away. Graceful arches, massive columns, curving marble staircases, gold leaf, glittering crystal chandeliers – the Athenaeum would be the crown jewel in any city in the world. As Gerry remarked, though, it appears that to meet the requirements of the Romanians with Disabilities Act, there must be stairs so that you don’t have to haul yourself up by a rope. If there were elevators in any of the buildings we visited, they were well concealed. 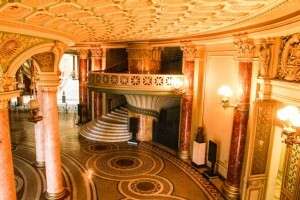 The concert hall is on the first floor (second floor to us Yanks) and is as spectacular in its own way as the foyer. The semicircular walls behind the seats are painted in a diorama representing the entire history of Romania, from the days of the Romans to the last years of the nineteenth century. The ceiling of the concert hall is a dome studded with round windows that can be shuttered to keep out the light during performances. Above and behind the stage are the pipes of an immense organ, gleaming like the folds of a golden curtain. Red velvet seats and gold leaf touches on carved wood add richness and warmth to this beautiful performance space. Romania’s most famous composer and teacher of music was George Enescu, who died in 1955 and is revered throughout the country. His statue is prominently displayed on the landing of the grand staircase of the Athenaeum, and there are bronze plaques on several buildings in Bucharest marking places associated with his life and career. One of his best-known students was the great violinist Yehudi Menuhin, not a bad way to cement your reputation as a teacher. Our second stop was at the massive People’s Palace, now the Palace of Parliament. (We learned long ago that in many countries, the word “palace” is used for any imposing building associated with government and is not restricted to royal residences.) 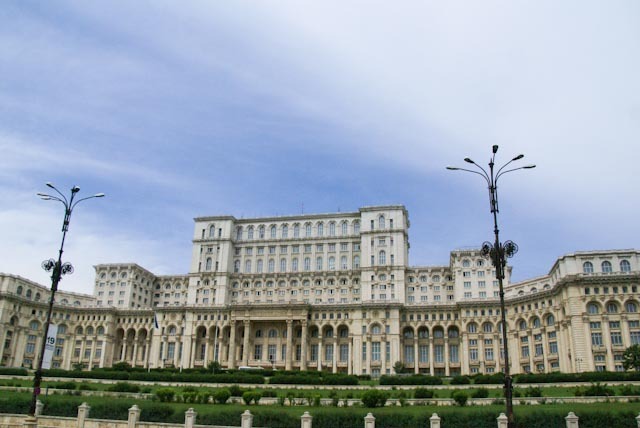 This monumental atrocity, the second largest building in the world after the Pentagon, was intended to be the crowning showpiece of the Romanian despot Nicolae Ceausescu. He had his finger in every aspect of its design and construction, making changes even after something had been built, with the result that the building was only two-thirds finished in 1989, when Ceausescu was deposed, tried, and executed. It has been almost completed now, with only a vast network of underground tunnels left unfinished. It contains a thousand rooms, and rumor has it that not even the people who work there have seen all of them. All the materials used in the building were Romanian, even if that meant the total depletion of the natural resources from which they were taken. The estimated cost when construction was halted in 1989 was $5 billion; we don’t know what was spent to complete it. We do know that the income from renting various halls and rooms doesn’t come close to covering the cost of basic maintenance, so the building is falling into disrepair. Ostentatious, tasteless, and unimaginably extravagant, the building is a monument to the ego of one man, who didn’t care if he bankrupted his country in the process of proclaiming his own importance. In order to make room for the building, Ceausescu ordered that 28,000 homes be torn down and the hill on which they stood, one of the seven upon which the city was built, be leveled. The residents of those homes were relocated to concrete-block apartments, where they often lacked water, electricity, and decent sanitation. They were not permitted to keep their dogs in the apartments, so the animals were abandoned to live on the streets, resulting in today’s 500,000 stray dogs in and around Bucharest. As well as homes, many historically significant buildings, mostly churches, were demolished; a very few were moved to other locations in the city. We had a charming young local guide as we toured less than five percent of the palace, which helped to ameliorate the sense of distaste we felt at the waste of precious resources squandered on the building. She had every relevant statistic at her fingertips and knew to the last ounce what the 185-foot-long gold-embroidered velvet draperies weighed that flanked the windows on a pair of staircases. She had a quick wit, too, which reminded us that the Romanian people were able to endure life under a Communist regime partly through the subversive use of humor and satire to deflect cruelty and oppression. These days, the palace houses the Romanian Parliament, which occupies only a small portion of the available space, and most of the vast rooms are empty of everything except carpets on the marble floors. They are rented for events and conferences, which helps to pay for the upkeep. The Romanian Olympic gymnast Nadia Comenici held her wedding in one of the largest of these rooms, where Ceausescu had planned to have a giant portrait of himself on one wall and one of his wife on the facing wall. But then he became jealous of his wife for some reason (apparently she was a terrible woman, with a will of iron) and decided to put his own portrait on one wall and a gigantic mirror on the facing wall instead. Fortunately, neither of these decisions was implemented. We covered two kilometers and climbed over 200 steps during our tour of the palace (yet another statistic our guide, Lara, gave us at the end – if she’d done it at the beginning, she might have lost a few of us), so we were ready for lunch. This time, we were driven to a delightful tavern, Cara Cu Bere, in the heart of the old city, where a phalanx of cheerful young waiters served up a menu of traditional Romanian cuisine. From the spicy beet soup to the chicken to the epergnes holding pickled fruits, it was a unique dining experience. If you’ve never tried pickled grapes, well, what can I say? Like a lot of experiences, I’m glad I did it once, but once was enough. I can’t leave Romania without saying a little more about Nicolae Ceausescu and his wife, Elena, who was despised even by her own children. The dictator habitually made speeches, surrounded by a cadre of the faithful, from the balcony of one of the ministries, where 300,000 cheering people would gather in the square and the street below. One fateful day in December 1989, when he appeared on the balcony, he was stunned to hear the 300,000 people shouting for his resignation. He looked around for his entourage and found himself alone. Escape by the usual routes was impossible, so he summoned a helicopter to pluck him from the roof of the ministry and fly him to safety. Unfortunately for him, the helicopter had to land somewhere within the country, and Ceausescu was quickly arrested, together with his wife. After a hastily-arranged show trial, both were convicted of crimes against the people and were taken from the room to a courtyard, where they were summarily executed. The trial and the executions were filmed in their entirety and were shown on Romanian television over and over during the following days, so the people would know it was true that the despot was dead. A video about Ceausescu containing some of this footage was shown to the passengers on the riverboat and was very impressive. Back on the bus, we headed out of the city for the last time and toward Cernavoda, a town near the mouth of the Danube where our riverboat was (we hoped) docked and waiting for us. As we crossed the bridge to the other side of the river, we could see two riverboats docked side by side, but there didn’t seem to be much in the way of a pier. Our driver began to maneuver the coach down progressively narrower and less-paved streets in the general direction of the river, until we were slogging through mud and dodging goats and stray dogs. Our Tauck tour director, a very pleasant and competent woman from Hungary, growing slightly worried, began asking plaintively over the microphone if anyone had seen the ship, and if so, would that person please let the driver know. Just then, the river appeared before us, and there was Treasures, Tauck’s newest riverboat, launched just last October and still sparkling and new. The boarding process was mercifully swift, and we were soon settled into our cabin, where all our luggage was awaiting our arrival. As you may know, the cabins on most riverboats are notoriously small, since the boats themselves are required to be quite narrow and low enough to pass under bridges and through constricted waterways. So no 1,000-square-foot suites, unless you rent the lounge for the duration of the trip. On Treasures, all the cabins are 150 square feet, including the closet and the bathroom, except for one deck of larger rooms. We’d initially booked a standard cabin, but then we realized that this cruise would be just the beginning of our ten weeks in Europe, for which we needed a whole lot more luggage than we would have needed for the cruise alone. The boat has no facilities for storing luggage, so we would have to keep it all in our cabin. In addition, the question of closet space occurred to me, since I’m the one who does the packing and unpacking. Our travel agent checked with clients who made this same cruise on this boat last fall and learned that there was one small closet for the two of them, so I knew I couldn’t even unpack one of our suitcases. So we bit the bullet and upgraded to one of the larger cabins, for which we are unbelievably thankful. Three weeks on the river in 150 square feet with your loved one could lead to homicide and suicide, in that order. The boat (I refuse to call it a ship, although its proper designation is MS Treasures) is absolutely beautiful and immaculately maintained. Every aspect of its design and decoration has been carefully thought out to maximize the space available and to make the passengers as comfortable as possible. The interior colors are shades of gold and bronze, with black and brown accents, and the furnishings are scaled to the size of the boat. Our bed is very comfortable and inviting after a long day of touring, and we have a walk-in closet, a tub and separate shower, and two French balconies that give us a floor-to-ceiling, almost wall-to-wall view of the passing scenery. I’ll describe the amenities like food and wine next time – or I’ll ask Gerry to do it, since that is his specialty. And so we sailed for Ruse, Bulgaria, and the beginning of our first riverboat adventure. For more pictures of our day in Bucharest, click here.